The husband of my third cousin, a "Living Densmore." My third cousin once removed, a "Living Desantis." My third cousin, a "Living Erickson." The husband of my paternal aunt, a "Living Vanhille." My third cousin once removed, a "Living Westby." 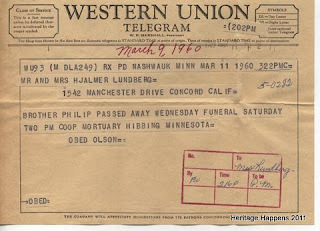 My paternal uncle, a Lundberg. My paternal aunt, a Lundberg.